We know. Finding satisfying snacks on the keto diet can sometimes be a challenge. We recently did an article of some of our favorite keto snacks for on the go. Those are more grab-and-go style foods that you can eat quick, fast and in a hurry. If you need something a little more gratuitous try one of the simple keto friendly snack recipes below. These foods are comforting and can help satisfy a craving without taking you out of ketosis. Some of these will also remind you of childhood favorites and we’re thinking your kids will probably love them too. 🙂 The added bonus? Many of these snacks double as side dishes to your favorite keto meals. 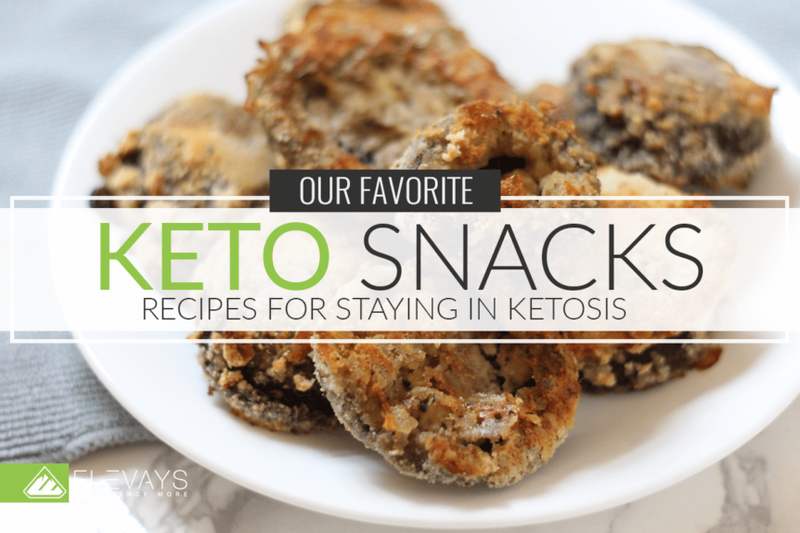 Keep checking back as we’ll continue to add to this list of our favorite keto snacks! It’s hard to find Keto Snacks that are great for adults and kids alike, but these chicken fingers (that can also easily be made into chicken nuggets) make for an easy Keto Snack that the kids will go crazy over and you will love too! Crack your egg into a separate bowl, whisk with fork until combined. Combine all dry ingredients - almond flour, sea salt, black pepper and spices in a separate bowl. Place oil in a deep skillet and warm on medium heat. Take chicken fingers and dredge in egg and then toss in almond flour mixture. Place on a separate plate. If you want to make nuggets, cut up chicken into cubes before dredging. Place chicken in deep skillet and let cook for 3 - 5 minutes until lightly brown on one side. Flip chicken with thongs and cook an additional 3 - 5 minutes until brown and cooked through. Place chicken on plate with paper towel and let cool. Enjoy with your favorite keto dipping sauce! Primal Kitchen salad dressings would be great options here as well! These are so tasty, that even the boys love them! This is a comforting classic, gone Keto. This is an easy snack to throw in a lunch box or to hold you off in the afternoon. Satisfying and simple, many keto lovers keep deviled eggs on hand to eat solo or to use in recipes like this one. Place the eggs in a saucepan and cover with water. Cover with a lid and bring the eggs to a rolling boil. Let the eggs boil for 1 minute and then off the heat. Let the eggs stand for 12 minutes in the hot water. After the 12 minutes rinse the eggs with cold water. When cool enough to handle, peel the eggs and slice them in half, lengthwise. Remove the yolks and smash them up in a bowl with the back of a fork. Add your mayo, mustard, cayenne, sea salt and pepper and mix well. Take a spoonful of the mixture and add it back to each egg half until each halve is full. Serve with a side of dill pickles if desired. Enjoy! This is a convenient keto snack that our kids also enjoy. This is a great way to enjoy classic sandwich ingredients in a way that’s keto-friendly. Feel free to change it up based on your taste. There are many possibilities here! Your favorite “sandwich ingredients” like: Avocado Tomato, Cheese, Mustard, Mayo, Lettuce, Dill Pickles, Onions, Pesto, etc. Slice your “sandwich ingredients” thin so that they fit nicely into the roll up. Take a piece of meat and layer your sandwich ingredients inside adding your condiments last. To Change It Up: Try rolling your sandwich in a piece of lettuce and/or dipping your roll up in your favorite keto dipping sauce. Calling all lovers of mushrooms, you’re about to meet your new favorite Keto Snack! This recipe can enhanced with cheese and sauces, but the basic recipe will hit the spot all on its own. These make enough to easily be a side dish but they also are a fantastic keto snack! De-stem and rinse mushrooms in strainer. Crack egg separately in one bowl and whisk. Combine almond flour, salt, basil and optional cheese in separate bowl. Take a baking sheet and place parchment paper on top. Take your 2 tbs of oil and spread out evenly with basting brush on parchment paper. Dry off rinsed mushrooms and dip in egg bowl then roll in dry ingredients in the second bowl. Place on baking sheet. Repeat until all mushrooms are covered in egg and batter. Place mushrooms in oven and flip with tongs after 12 minutes. Let bake for an additional 10 - 12 minutes. Eat plain or dip into your favorite keto sauce! If you’re craving something hot and delicious with a touch of crunchy goodness then it’s time to make a hot pan of Zucchini Fritters. These are so easy and quick to whip up, making them a perfect Keto Snack. This is a basic Keto recipe that you can add anything else you want to, but we promise the basic recipe is delicious on its own! Grate zucchini either by hand or in a food processor. Place the zucchini in a strainer and sprinkle with sea salt. Let sit for 5 minutes then squeeze as much of the water out of the zucchini as possible. Water is not your friend here as you don’t want soggy fritters, so don’t short cut this step. Mix the zucchini with your almond flour, eggs, sea salt, pepper and optional ingredients. Let sit for another 5 minutes. Warm up your oil in your frying pan over medium heat then take a spoon and scoop about 2 tbs worth of batter into the hot oil. Flatten with your spoon to make a flat and somewhat round fritter. Fit as many as you can into your pan without overcrowding. After about 2 - 4 minutes your fritters will be brown enough to flip. Once they’re brown on both sides, remove and place on a plate with a paper towel to absorb any left over oils. Repeat until you’ve made your way through all of your batter and enjoy!